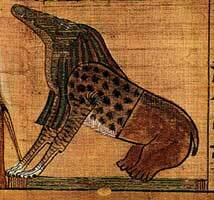 The ancient Egyptian goddess Ammit (also known as Ammut and Ahemait) was the personification of divine retribution. She sat beside the scales of Ma’at ready to devour the souls of those deemed unworthy. Those unfortunate enough to fail the test would suffer the feared second death, and have no chance of the blissfull life of the field of reeds instead roaming restlessly for eternity. Thankfully, the judge (Osiris) was not too harsh, and the prosecutor (Thoth) was a pretty enlightened guy. The deceased made a negative confession (i.e. they listed the large number of evil things they had never been guilty of) and then their heart was weighted against the feather of Ma´at (justice or balance). It was not necessary to be totally good, just reasonably well balanced. There were also a number of spells and amulets the deceased could use to increase their chance of success. Her name, is generally translated as “Devourer”, but could also be the chilling “Bone Eater”, and she was known as “Devourer of millions” leading to the suggestion that the god Am-heh was one of her aspects. Some scholars have linked Ammit with the Hippopotamus goddess Tawaret, because of the similarities in their appearance and their role in fighting evil. According to some traditions, she lived by the scales of justice, but other sources suggested that she (like Am-heh) lived by a lake of fire into which the souls of the guilty were thrown. According to these traditions, she did not devour the souls, but protected the lake. This has led some to suggested that she may be linked to Sekhmet due to her lionine characteristics and her role in protecting a lake of fire. She was generally depicted as a demon with the head of a crocodile, the torso of a wild cat, and the hindquarters of a hippopotamus. However, she also took human form. 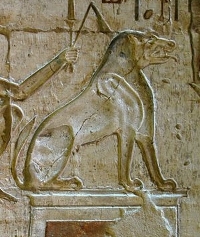 Ammit was never worshipped, and was not strictly a goddess, but her image was thought to ward off evil. She was the personification of all that the ancient Egyptians feared and a reminder to live by the principles of Maat. Although she was referred to as a demon, she was in reality a force for order. Moreover, each person was at least given the chance to defend their life before being consigned to eternal damnation.